We realise that most people can't be bothered with reading the fine print, and are primarily interested in the practical result. So rest assured, feeding 100% organics gives you a real difference you can see in your horse. What can confuse people is that 'organic' in relation to minerals does not mean the same as 'organic' in the supermarket. Organic refers to the the chemisty of the mineral, the structure of the molecule, and how the body reacts to it. There are also different quality levels of organics - the highest quality being a proteinate, which are used exclusively in Elite Equine formulas. W HAT MAKES PROTEINATE MINERALS DIFFERENT? What makes proteinate minerals special is the shape of their molecule. Every substance in the universe is made up of molecules. It is the shape of that molecule that helps defines the substance. A molecule is make up of atoms and links. Proteinate molecules are in a stable ring shape, sort of a circle, with no little atoms or sharp bits sticking out ready to attach to other molecules, which would turn it into another substance, perhaps something toxic (this is why some in organic or synthetic minerals are poisonous in high levels or unstable). The links between atoms are also very important, because if they are sensitive to gut acid then the mineral breaks down before it is digested, is useless to the animal and needs to be excreted. This is why proteinate minerals are so superior to other minerals, and perform so much better than even other chelates. Their links are made of protein and so are very stable in gut acid but are easily digested and the shape is stable. Also we only use Alltechs Bioplex minerals that are tested for contaminants both before AND after processing to ensure they are contaminant free. Here is a link to a page on mineral chelation at Wikipedia and is very informative. Proteinates are the highest quality chelated mineral. The links made of protein make the difference. Feeding high quality organic minerals versus inorganic minerals is not just peace of mind. There is a real difference you can see. Horses respond by conditioning better, recovering better, their coats improve, feed utilisation improves, temperaments settle and they perform better. They are also far less likely to come across health challenges long term. Top quality nutrition supports all the systems of the body, helping them to work better and more efficiently. Please also regard blood tests with caution. A blood test records the amount of mineral circulating around your horses blood stream at that point in time. It will also record and pick up minerals that your horse is unable to utilise, because many lower quality minerals enter the system via osmosis and are not selectively absorbed. So bear in mind the picture can be misleading. We say to allow up to 2 months to see the difference, however, most people see a result much quicker. How long it takes depends on the individual horse. Bear in mind that each dose is a long term maintenance dose, so it does take a little time to get your horses levels up to a point where you can see improvements. Having said that, some horses respond very quickly. 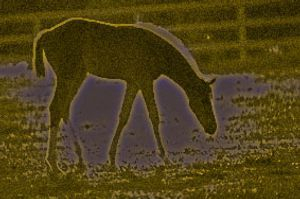 Soil tests are not an ideal way of determining what your horse needs. It does not take into consideration bioavailability of the minerals detected. Also, a horse in work burns more minerals than one at rest. By feeding exclusively proteinate organics you ensure that if your horse does receive excess to his needs, as they are safely excreted and are non toxic. Synthetic and inorganic minerals have much more unstable molecules than high quality organics and they tend to react more readily with other vitamins and minerals. They are sensitive to changes in pH like those in saliva and gut acid, which causes them to break down, becoming less available to the horse. They also can become toxic due to the body not being able to process them as easily. Mineral contamination is a global problem. Around 28 - 45% of minerals are contaminated with dioxins, PCB's and heavy metals, so that is potentially around 1/3 of the tub you are feeding your horse! You may have seen the recent news articles on television regarding high levels of contaminants in the soil due to contaminated minerals used in fertilizers. The environmental impact of feeding synthetic minerals is also significant due to these minerals being continually excreted into the soil. The toxic contaminants can build up over time. Organic minerals are much more environmentally friendly as well as being better for your horse. Alltech have a unique quality program called Q+ and are the only company that test the minerals before purchase and after processing to ensure no contaminants get through to the final product. The product has total traceability from raw material to end product. Alltech reject a staggering 33% of all raw materials for contamination! The Q+ program integrates the Bio Plex quality measures, as well as guaranteeing total chelation and mineral content. Feeding synthetic minerals with vitamins is extremely hit and miss due to potential interactions between them. Synthetic minerals can also be toxic in large amounts and so great care is needed when feeding them in conjunction with other supplements and balanced feeds. WHY ARE ALLTECHS MINERALS SO SUPERIOR? The minerals in our formulas are all exclusively proteinate minerals, the highest quality organic minerals in the world. These minerals are 100% absorbable, stable and non toxic. Why is this important? Because organic and synthetic minerals are absorbed completely differently and have different toxicity levels. Synthetic minerals are absorbed by osmosis, meaning the principal of equalization. They are taken in by the body indescriminantly, but are far less able to be ultitised and have a higher toxicity level. For example, Selinium selinate was the synthetic form of selenium responsible for the deaths of 21 polo ponies in Florida in April 2009. High quality organic minerals, on the other hand, are selectively taken up by the body, are completely bio-available, stable in the gastric system and the tub, and are almost completely non-toxic. Any excesses are easily excreted. They are body friendly.